CHESAPEAKE, Maryland, USA. — There are plenty of reasons not to jump into a freezing river in the middle of winter, but none of them stopped a committed group of advocates for climate justice during a fundraiser last month. 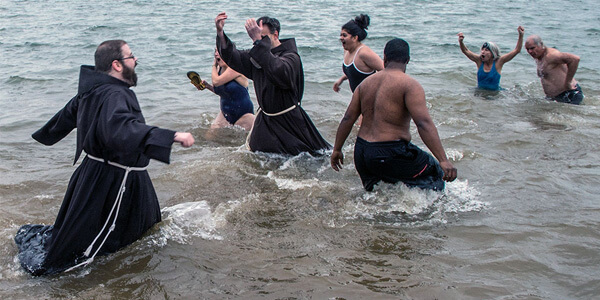 More than 200 people — including American friars from the Holy Name Province, Dennis Bennett, OFM, Jacek Orzechowski, OFM, and postulant Angel Vazquez — splashed their way into the frigid waters of the Potomac River on Jan. 24 as part of the 10th annual Chesapeake Climate Action Network’s “Keep Winter Cold” Polar Bear Plunge. The event raises awareness about the climate crisis while raising funds to support CCAN’s work for clean energy solutions across Maryland, Virginia and Washington, according to the organization’s website. A few days before the event, the National Oceanic and Atmospheric Administration reported the average combined global land and ocean surface temperature for 2014 was the highest on record, underlining the need for reform.